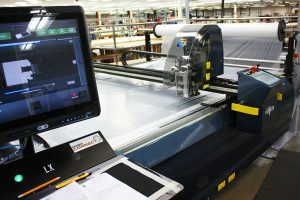 Our CNC (Computer Numerical Controlled) fabric cutter makes sure your canvas is an accurate fit. No one offers custom fit boat covers quite like AmeritexDirect replacements parts. That’s because, if you can find your manufacturer and model listed here, we were the ones that patterned your boat and manufactured the original canvas even before it left the boatyard. That’s what we do. We are an Original Equipment Manufacturer (OEM), and we take great pride in engineering our boat covers and boat tops to fit perfectly, to a T. The best part is, if you order from us here on AmeritexDirect.com, we will use those same exact original, digital patterns to custom sew your replacement fitted boat cover to the identical specifications as when it was new. This means that your new boat canvas will fit as precisely as the original. Your worn out boat cover or top has served you well for years. Let us provide you with a brand new version that fits just like the original. Your boat means a lot to you. And you take care of it. Talk to us about how you can replace old canvas with new, correct-fit tops and covers, designed specifically for your make and model. All you need to do is fill out our easy-to-use quote request here.